There are no great surprises here as Ray runs the gamut from folk rock through bluegrass to pure country but the beautifully warm analogue recording and stellar cast of supporting musicians means that what Holler does have is class by the bucketload. Amy Ray wrong-foots the listener from the word go as the sleepy county prelude ‘Gracie’s Dawn’ is abruptly interrupted after just 40 seconds by the urgent folk rock of ‘Sure Feels Good Anyway’ and the album begins in earnest. The song tackles the politics of prejudice and patriotism in the Southern states - a tension that obviously has resonance for Ray, who grew up in rural Georgia and describes herself as a “left-wing Southerner who loves Jesus, her homeland and its peoples.” These themes are also present in the record’s closing number ‘Didn’t Know a Damn Thing’, a philosophical look at American history in the South. Several of the tracks here are a pointy-booted step too far in the country direction for me but nevertheless are very well executed. If you’re a fan of all that thunking bass and elbow-led dancing then ‘Oh City Man’, ‘Tonight I’m Paying the Rent’ and ‘Jesus Was A Walking Man’ should have you dusting down your Stetson. More interesting, to my ears at least, are the tracks that are stylistically more ambiguous: ‘Dadgum Down’s bluesy beginnings give way to a more melodic chorus that has Alison Brown’s magic banjo bluegrass dust sprinkled all over it. Likewise ‘Sparrow’s Boogie’, which begins with raggedy distorted electric guitar and a snarling vocal blossoms into something softer and more polished that would not - perhaps unsurprisingly - be out of place on an Indigo Girls album. The nicest surprises, however, are to be found in Holler’s most intimate tracks: ‘Fine With the Dark’ is just acoustic guitar and vocal and neatly upends the idea that darkness symbolises evil and results in a softly-sung love letter to all things nocturnal. At just over a minute long ‘Old Lady Interlude’ is a perfect lump-in-your-throat vignette, swathed in strings and Jeff Fielder’s wistful dobro. Elsewhere, title track ‘Holler’ displays a rarely heard vocal fragility and its arrangement is appropriately spacious and light-touch, with gentle piano and Matt Smith’s restrained pedal steel. The more resigned ‘Bondsman’ has a similar gentleness but is more lavishly dressed in yearning strings and brass, the grandeur of which bring a kind of dignity to the song’s ultimately tragic tale. And you wouldn’t refuse Derek Trucks a guitar solo in the middle of all that, now would you? That stoic New Orleans brass is also draped over the mellow six-eight weepiness of ‘Last Taxi Fare’ which should hit the Goldilocks spot for all you country-with-a-small-c fans out there. Special mention must also go here to Vince Gill and Brandi Carlile who both turn in inspired vocal performances on either side of Ray’s mic. There’s a musical richness on offer here that really reflects Amy Ray’s pedigree as both a songwriter and performer. 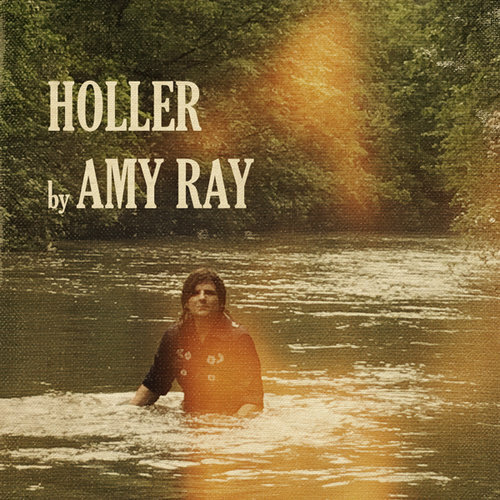 If, like me, you’ve never felt particularly drawn to this Indigo Girl’s solo work, Holler goes a long way to dismiss any fears you might have that Ray isn’t able to deliver varied, textured and dynamic records when she stands as an artist in her own right. This record successfully draws on a broad range of Americana sub-genres to create its own balance of light and shade. Holler has moments of raw beauty that I just wasn’t expecting and these are, most definitely, worth shouting about.